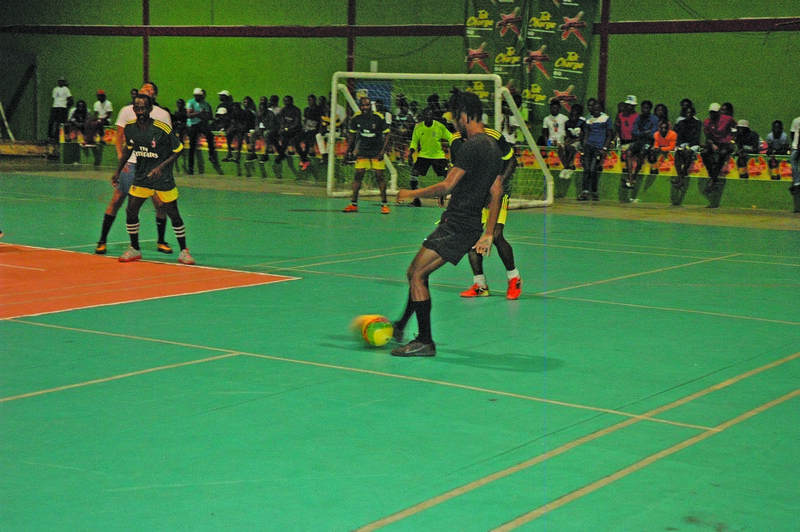 Ten matches, eight winners; that is how the night unravelled on Saturday when the second edition of the Magnum Mash Cup Futsal Tournament continued at the National Gymnasium. The other two showdowns ended in stalemates, but were not short of action. Among those registering convincing victories were Ansa McAl who dominated Agricola 7-1 in the opening match of the night. Delroy Deen’s hat-trick ( goals in the 6th, 10th, 17th minutes) and braces from Reon Hopkinson (12th, 15th) and Akin Curry (18th, 19th) ensured the commanding win even though Akeem Pompey scored a the equaliser in the seventh minute for the opposition which was easily overshadowed. Gold is Money were right on the money with their 7-0 destruction of California Square. Michael Pedro recorded the other hat-trick of the night in the final match on the cards. He scored in the 13th, 14th and 16th minutes while Randolph Wagner supported with a double (4th, 15th) and Colin Nelson and Phillip Rowley netted a goal each. Sophia enjoyed a comfortable 5-1 victory over Rhythm Ballers. Sophia were led straight off the whistle by Shemroy Arthur, who scored in the first and 14th minutes while a goal each from Dwayne McLennon, Ryan Jeffery and Stephon Maycock were enough to get them the win. The opposition’s lone goal was scored by Orville Stewart. Showstoppers were almost stopped in their tracks by Island All-Stars, but perseverance prevailed in a see-saw battle which ended 3-2. Showstoppers netted first when Marvin Josiah found the back of the net in the ninth minute, but Devon Hyman’s quick double (14th, 15th) put the All-Stars in a firm position. However, Dexroy Adams had a similar burst of success for Showstoppers and capitalised by finding the equaliser in the 17th minute, then followed up with the decider in the 18th minute. Tiger Bay tore apart Silver Bullets 3-0 as Deo Alfred scored in the 8th and 15th minutes while Akeem Saul supported with a goal in the 19th minute. Another three goals were shared between two teammates as Back Circle got past East La Penitence 3-1. The efforts of Stephon McLean (9th, 17th) and Cecil Jackman (2nd) overpowered East who had their lone goal scored by Alwyn Moore. Stabroek Ballers were also victorious with a 2-0 triumph over Capital Strikers, as were North Ruimveldt who needled Mocha 1-0. Meanwhile, Alexander Village played to a 1-1 draw with Hustlers while Melanie and Kingston’s showdown ended nil-all. The action continues on Wednesday, February 13 at the same venue. Previous articleIs this the new PNC tactic?